Two upcoming conferences that might be of interest to z=z readers, one on each coast. This weekend (March 27th, and 28th), Berklee College of Music is hosting the Music and Entertainment Educators Association conference. Unsurprisingly, given its audience, the schedule is a mixture of industry panels—keynotes on “The New Entertainment Economy” and on “Marketing and Distribution in the Digital World,” for example—as well as academic talks (such as “Audio Mashups and Fair Use: The Nature of the Genre, Recontextualization, and the Degree of Transformation”). 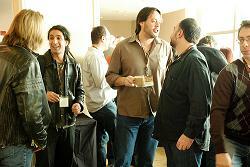 The speakers include executives from Sonicbids, Topspin and Electronic Arts. You can see a full schedule here [PDF], and you can register at the conference website. On the other coast, the San Francisco Music Tech Summit is scheduled for May 18th at the Hotel Kabuki in Japantown. Scheduled speakers include Dave Allen (of Pampelmoose and Gang of Four), the founder of Pandora, the director of technology of Sub Pop, and more. Again, you can register at the conference site, here. If you can’t make either, never fear – keep an eye out for z=z reports from both conferences.